NEW YORK CITY — The number of 311 calls about the homeless has jumped nearly 60 percent since Mayor Bill de Blasio took office, records show. Between Jan. 1, 2015, and Aug. 9, 2015, the city's 311 system received 20,242 calls about a homeless person in need of assistance, in an emergency situation or living in an encampment, according to the mayor's office. If the rate of calls continues, the number could surpass 33,500 by the end of the year. During the same period in 2013 — Mayor Michael Bloomberg's final year in office — 12,715 calls about the homeless were made. For all of 2013, there were 21,882 calls about homeless to 311. For all of 2014, de Blasio's first year as mayor, there were 25,357 calls. In recent weeks, the city's homeless population has become a topic of debate — one centered on whether the population has truly spiked under de Blasio or a moderate rise has been misconstrued by alarmists. The city's homeless population was 52,000 when de Blasio started as mayor. The mayor's office said the current population is 56,000, but it reached a record 59,000 in December 2014. Mayoral spokeswoman Karen Hinton said the drop indicated that the de Blasio administration is making headway. “Under Mayor de Blasio’s leadership, homelessness is on the decline," she said. "Previous administrations drastically reduced the homeless budget and, as a result, the number of homeless jumped from 36,000 in 2005 to 59,000 in 2014." Hinton added that de Blasio is increasing the city's budget for homeless issues by $1 billion over a four-year period, adding new programs that target mentally ill individuals. She also said the NYPD "is aggressively enforcing quality of life violations." While the homeless population has dropped slightly from the record high of 59,000, the 311 information shows that the number of complaints about the homeless has steadily risen each year since 2010. And it skyrocketed after de Blasio's inauguration. Of the 20,242 calls so far this year, 5,217 were logged as service request complaints about a homeless person in need of assistance, a homeless encampment or a homeless person at the Staten Island Ferry. Those complaints are viewable on the city's open data website. The other 15,000 calls about the homeless were not logged in the 311 system because 311 operators re-routed those calls to 911 since they required an immediate response. Of the 25,357 calls about the homeless to 311 in 2014, 4,926 were recorded as service request complaints in the city's. The other 20,000 calls were forwarded to 911 and not logged. In 2013 the 311 system recorded 2,933 of 21,882 calls about the homeless as service request complaints. The city's open data site shows that 311 recorded 1,787 service request complaints about the homeless in 2010. Two years later, 311 recorded 2,187 service request complaints about homeless. The Mayor's Office didn't immediately provide the total number of calls about the homeless that 311 received for those years. The mayor's office provided the call numbers for 2013, 2014, and 2015 to DNAinfo New York to give context about the spike in 311 homeless complaints. Hinton attributed part of the call increase to the de Blasio administration encouraging people to dial 311 about quality of life complaints more so than the Bloomberg administration. She also provided numbers that show more people are using the 311 smartphone app to make complaints about the homeless. Lauren Pohl, who lives in Murray Hill, said she "was not surprised" by the surge in 311 complaints. She has called 311 twice in the past month about homeless encampments. The mother of two young children said that in the past year an influx of encampments have sprouted in her neighborhood — which includes Bellevue's 850-bed men's shelter and Mainchance, a homeless services agency. "We've seen a huge number of homeless men on Third Avenue between 28th Street and 34th Street," she said. Pohl, who has lived in Murray Hill since 2007, said the rise prompted her to co-found a Facebook page and website called Third and 33rd (and Beyond! ), where residents discuss the issue and post photos of what they see on their streets. "We thought it was a good way for business owners and resident to communicate, group together and get the attention of elected officials," she said. The forum has worked, she said, as it has led to meetings with local councilmembers Dan Garodnick and Rosie Mendez. She said her group also learned recently from Garodnick that the Bellevue Shelter, the largest in the country, would add six peace officers as part of de Blasio's Safe NYC plan. The mayor announced the $22 million initiative last week that aims to help individuals with untreated serious mental illness who pose a concern for violent behavior. 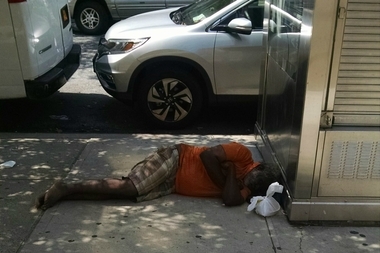 City Councilman Stephen Levin, who chairs the council's general welfare committee, told DNAinfo that de Blasio shouldn't be blamed for the surge in complaints about the homeless. Levin said the mayor inherited a growing homeless population — one that includes families more and more — due to bad policies started under the previous administration. "A lot of that had to do with the Bloomberg administration not having a rental-subsidy program, particularly for families," he said. "That had a real impact." The councilman said one crucial component to solving the homeless crisis in the city will be a new New York/New York agreement. Mayor David Dinkins and Gov. Mario Cuomo hashed out the first New York/New York agreement in 1990 in which the city and the state reached a deal to build supportive housing units for the homeless. The housing also provides residents with counseling and social services. Two other agreements to build more supportive housing were reached in 1999 and 2005. Gov. Andrew Cuomo and city officials are expected to begin negotiations on a fourth agreement in the next couple months, but both sides' proposals diverge widely. Cuomo has offered 5,000 additional units of supportive housing over the next decade, Levin said, while the city hopes to get 30,000 units. Levin said 30,000 units would cost millions but would be spread out over 10 years. He said the agreements have been "incredibly successful" since Dinkins and Mario Cuomo reached the first. "They saw the need for supportive housing for the homeless in the city and came up with this in the first place," he said. "It’s a model that works. It’s entirely cost effective." EDITOR'S NOTE: An earlier version of this story incorrectly gave the wrong date range for 311 calls about the homeless. The 311 system received 12,715 calls from Jan. 1, 2013, to Aug. 9, 2013. There were not 12,715 calls for all of 2013.